2nd cruise on Oceania Riviera, 24th Cruise. First sailing was Amalfi Coast, beautiful but - no sea days to enjoy the ship. We very much enjoyed the ship this time. The ship is the perfect size for us, 1250 PAX with beautiful public spaces decorated with large scale holiday decorations, Lalique glass, Art Deco interesting furnishings, Artwork, and lots of seating areas scattered inside and out. Embarkation was quick at about noon and lunch at Waves and Terrace cafe — no, we didn’t eat at both but they are both great choices. The Terrace has a wonderful assortment of choices and the steak and seafood at the grill were great. The nice sized Balcony cabin has good storage and fine linens, comfortable bed, makeup mirror, lots of outlets, marble bath with deep sinks, small shower with wand and rain head good pressure, and big tub with another shower with wand. Loved the Bulgari toiletries. Our steward was very good, supplies replaced and always lots of ice and needed nothing. Spotless. There was no lack of activities though my favorite was my kindle and feet up on my balcony or on the leather chairs in the library after another cappuccino in Baristas cafe. There was mini golf, needlepoint, bracelet making, art classes (fun but I have no talent), lectures were excellent with Adam Tanner, cha cha classes, movies, and much live music. Others played bridge, trivia and more. The show band was wonderful, production singers and dancers exceptional and string quartet very good. Loved the group Ardor in Horizons and the Ukelele player/comedian better than that sounds. There were many performances in evenings and once in a while in afternoon. Do not miss afternoon tea with strings. 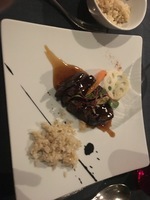 Specialties- Polo 5 stars, Jacques 5 Stars, Tuscana husband 4 stars, food a bit of a disappointment for me after great food last time and best of all Red Ginger — I had the best meal ever with edamame, greens with peanut dressing, tempura vegetables and filet entree & bounty cake dessert. Husband had red snapper and loved it. Service was great. Not so happy with Grand Dining room dinner especially beef. But breakfast was wonderful. Also prompt and handy is room service although no hot breakfast in balcony cabins. Kudos to all the service people onboard who had such great attitudes. I can’t say that we loved the ship excursions but In Grenada there was an excursion we liked to a plantation with Gorgeous vegetation, interesting owner and natural products. 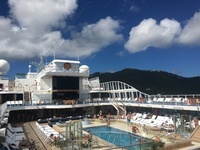 The ship did not feel crowded except for some scarcity of chairs in the shade — but the pool attendants were removing towels and clearing space. Nice cushions and seating around the pool. And not only are non/Alcoholic drinks included but I can go to the cappuccino machine myself any time and press the button for a quick to go pick me up. I can’t say enough about this sailing— I wish I could repeat it many times over. 2nd cruise on Oceania Riviera, 24th Cruise. 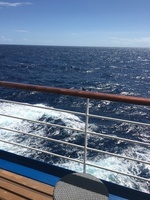 First sailing was Amalfi Coast, beautiful but - no sea days to enjoy the ship. We very much enjoyed the ship this time. The ship is the perfect size for us, 1250 PAX with beautiful public spaces decorated with large scale holiday decorations, Lalique glass, Art Deco interesting furnishings, Artwork, and lots of seating areas scattered inside and out. Embarkation was quick at about noon and lunch at Waves and Terrace cafe — no, we didn’t eat at both but they are both great choices. The Terrace has a wonderful assortment of choices and the steak and seafood at the grill were great. The nice sized Balcony cabin has good storage and fine linens, comfortable bed, makeup mirror, lots of outlets, marble bath with deep sinks, small shower with wand and rain head good pressure, and big tub with another shower with wand. Loved the Bulgari toiletries. Our steward was very good, supplies replaced and always lots of ice and needed nothing. Spotless. There was no lack of activities though my favorite was my kindle and feet up on my balcony or on the leather chairs in the library after another cappuccino in Baristas cafe. There was mini golf, needlepoint, bracelet making, art classes (fun but I have no talent), lectures were excellent with Adam Tanner, cha cha classes, movies, and much live music. Others played bridge, trivia and more. The show band was wonderful, production singers and dancers exceptional and string quartet very good. Loved the group Ardor in Horizons and the Ukelele player/comedian better than that sounds. There were many performances in evenings and once in a while in afternoon. 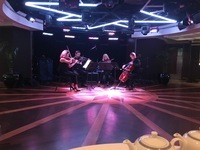 Do not miss afternoon tea with strings. 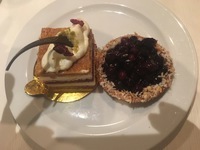 Specialties- Polo 5 stars, Jacques 5 Stars, Tuscana husband 4 stars, food a bit of a disappointment for me after great food last time and best of all Red Ginger — I had the best meal ever with edamame, greens with peanut dressing, tempura vegetables and filet entree & bounty cake dessert. Husband had red snapper and loved it. Service was great. Not so happy with Grand Dining room dinner especially beef. But breakfast was wonderful. Also prompt and handy is room service although no hot breakfast in balcony cabins. Kudos to all the service people onboard who had such great attitudes. I can’t say that we loved the ship excursions but In Grenada there was an excursion we liked to a plantation with Gorgeous vegetation, interesting owner and natural products. 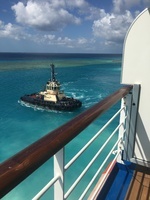 The ship did not feel crowded except for some scarcity of chairs in the shade — but the pool attendants were removing towels and clearing space. Nice cushions and seating around the pool. 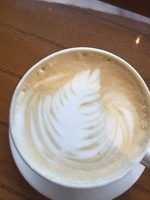 And not only are non/Alcoholic drinks included but I can go to the cappuccino machine myself any time and press the button for a quick to go pick me up. I can’t say enough about this sailing— I wish I could repeat it many times over.